Like what I say doesn’t matter. No one cares what I do. Or how I do it. After all, I am one in seven billion people on this planet. Why SHOULD anyone care? It’s been a tough week in my little life that no one cares about. Stressful, anxious, characterized by impatience, draining, running on empty. With the Open over, one is left ambivalent: glad but sad. And I would dare say, lost. On a whim, I decide to check out what you all are doing and what’s happening in your lives. I was led HERE a post where someone actually said I helped them. Me! My site. My words! My miniscule life. It was the boost I needed. To persevere. To strive, to seek, to find, and not to fail. To push back harder when pushed. To go against the grain. To be true to yourself when the world tells you to conform. To put yourself out there when others won’t. To be the best you you can be. You do make a difference. 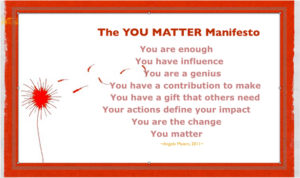 You do matter. You are significant. You are important. You contribute much more than you could ever dream. Fight for the good life. You deserve it. You will be rewarded. This was a good week in CrossFit. I strung together multiple bar muscle-ups. I nailed my kipping chest-to-bar pull-ups and strung together two of those. I PR’d Fight Gone Bad by 30 reps. My strength program is progressing nicely. I feel good. My aches and pains are almost eliminated. I feel like I’m over the injury hump. I’ve got my nutrition dialed in (I’ve lost 5 lbs and toned up). It makes a real difference if you feel like you’re progressing towards your goals. It makes life much more enjoyable. I’m looking forward to the Open. I’m getting stronger day-by-day. My skills are coming along. My conditioning is still stellar. Have I mentioned how much I love CrossFit?